What is New Year? It’s a party, that’s for sure. A time to make resolutions, to look back on the last year, and for some to make predictions. I like the predictions. The predictions about the coming year are okay, but the wrong predictions made in past years are fascinating and sometimes hilarious. Popular Science published a great photo gallery of their past predictions about automobiles. Some of their predictions were close, but the overall form of the car was off. In April 1966, Time ran a cover story that asked, “Is God Dead?” It was a fair question. Secularism dominated world politics in the mid-1960s. The conventional wisdom shared by many intellectual and political elites was that modernization would inevitably extinguish religion’s vitality. But if 1966 was the zenith of secularism’s self-confidence, the next year marked the beginning of the end of its global hegemony. In 1967, the leader of secular Arab nationalism, Gamal Abdel Nasser, suffered a humiliating defeat at the hands of the Israeli Army. By the end of the 1970s, Iran’s Ayatollah Khomeini, avowedly “born-again” U.S. President Jimmy Carter, television evangelist Jerry Falwell, and Pope John Paul II were all walking the world stage. The secularism that dominated politics and the thinking of political pundits also lead them to predict that as African countries became independent they would shake off the religion of the colonial powers, Christianity. Not long ago the Pew Charitable Trusts released results of a global study of Christianity. The map to the left shows the number of Protestants in different African counties. The bigger the circle, the more Protestant Christians in that country. I have highlighted four because they are among the 10 countries in the world with the highest numbers of Protestant Christians. They are Nigeria, South Africa, The Democratic Republic of Congo and Kenya. 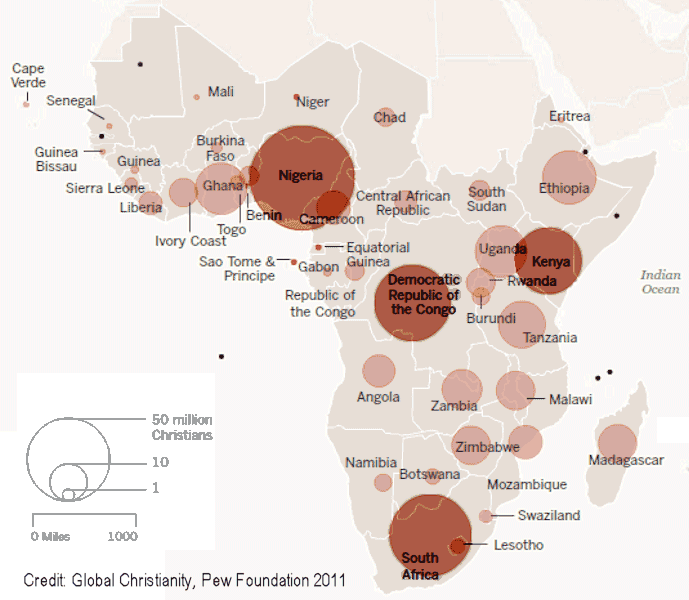 Of the top 20 countries in the world in terms of numbers of Protestant Christians, nine are in Africa. In Accra, we just experienced an event which illustrates the persistence and growth of Christianity in Africa. For its special New Years Eve service, one of the larger churches in Accra rented the national stadium. As you can see in the photo, they filled it. When Ghana government minister Elizabeth Ohene made her predictions for 2012 for the BBC, she said: “The area of the biggest growth on the continent will continue to be in religious congregations…” She is undoubtedly right, but beware, it is possible for those who believe to join in the spirit of the secularist prophets who were so stunningly wrong about the future of Christian Faith. We do that when we look at the trends in our country or our world and worry that they will overwhelm us. Instead, let’s trust and be faithful.